When Highland Woodworking saw how excited I was to head down to Atlanta for Jeff Miller’s Designing and Building Chairs class, they asked me to share why. Though I’m currently very fond of Jeff Miller’s work and teachings, this wasn’t always the way. I’ve been woodworking and aspiring towards making furniture for almost a decade, it was a good deal on a used copy rather than any burning desire to learn chairmaking that led me to first buy Chairmaking & Design by Jeff Miller. Up until then, I’d never had a desire to make a chair. Tables and cabinets seemed enough for me. That changed as soon as I read Chairmaking & Design. I think it is just about the best woodworking book I’ve ever read. I’ve had the chairmaking bug ever since. I often describe it as there is a chair in my head, desperately trying to get out. I’ve also been sold on Jeff Miller since reading the book. Over the summer I built his Benchtop Bench and this just cemented his status as a master instructor of woodworking. Given my chair obsession, it was with great excitement that I learned about Jeff’s upcoming Designing and Building Chairs with Jeff Miller class at Highland Woodworking. This class is described as covering the fundamental of chair design and function: structural soundness, comfort and visual interest. Other than his holding a class on Long Island, Highland was about the most convenient place for a class given the good friends I have in the Atlanta MWA Chapter who have been kind enough to put me up. In preparation for the class, I’ve taken out my Jeff Miller Chairmaking Techniques DVD. It’s a complement to the book, in that it shows some of the techniques described. Though only an hour long, Jeff manages to fit in much of the fundamentals. The DVD isn’t enough to build a chair from on its own, but I’m hoping it serves as an excellent primer for Jeff’s Class. I can’t wait to find out next weekend. Read Dyami’s 2nd blog entry about the class HERE. ———————————————————————————————————————————————————–Dyami Plotke is a Woodworker at home, blogger at The Penultimate Woodshop, and the Long Island Administrator and Podcaster for The Modern Woodworkers Association. Thanks for your inquiry about the bench. It is based on Jeff Miller’s BenchTop Bench which was originally published in Fine Woodworking. You can see Jeff’s article HERE. The screws are Shop Fox Veneer Press Screws which I picked up on Amazon HERE. Unfortunately, I found that as the handles themselves are not designed to have any force directly applied to them, they came off. I was able to correct this problem by adding pins which held the handles to the screws. You can see more about how I added the pins from my blog HERE. 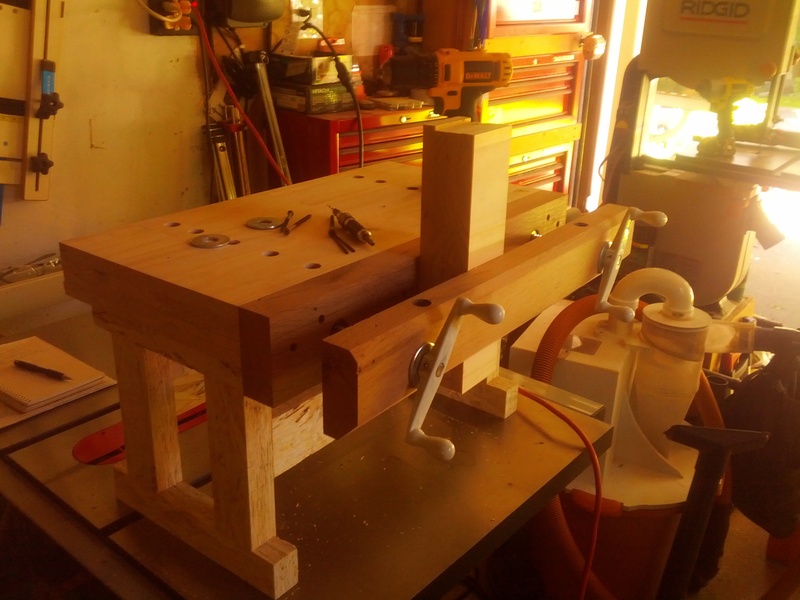 While the handles cannot be removed from the screws, the handle/screw combinations can be unscrewed from the bench When you do this the front vise jaw comes off and you’re left with a smooth, square edge (with two holes to accept the screws). The entire benchtop bench build is also documented HERE. This is a very good information seen i am also try to get more skill and plans to do my woodworking project.I really want to learn more about woodworking and enjoy to read your post.